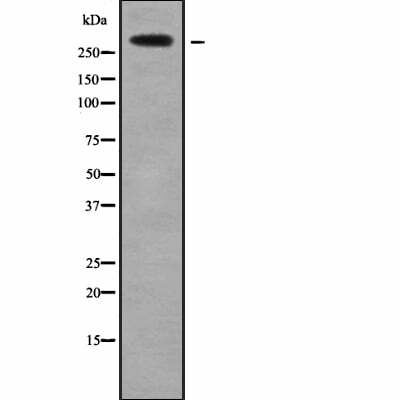 Small volumes of anti-HECTD1 antibody vial(s) may occasionally become entrapped in the seal of the product vial during shipment and storage. If necessary, briefly centrifuge the vial on a tabletop centrifuge to dislodge any liquid in the container`s cap. Certain products may require to ship with dry ice and additional dry ice fee may apply. Function: E3 ubiquitin-protein ligase which accepts ubiquitin from an E2 ubiquitin-conjugating enzyme in the form of a thioester and then directly transfers the ubiquitin to targeted substrates. Mediates 'Lys-63'-linked polyubiquitination of HSP90AA1 which leads to its intracellular localization and reduced secretion. Negatively regulating HSP90AA1 secretion in cranial mesenchyme cells may impair their emigration and may be essential for the correct development of the cranial neural folds and neural tube closure. Subunit Structure: Interacts with IGSF1 (PubMed:12421765). Interacts (via N-terminus) with HSP90AA1 (By similarity). Similarity: Belongs to the UPL family. K-HECT subfamily. 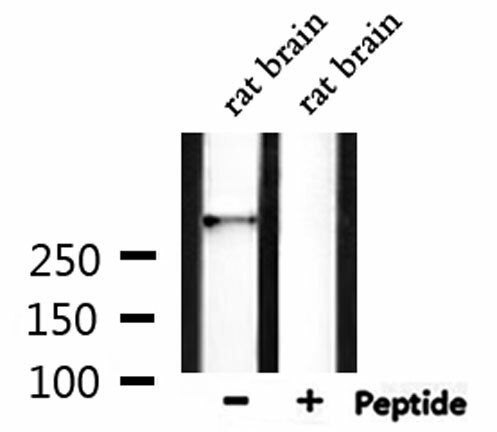 Western blot analysis of extracts from rat brain, using HECTD1 Antibody. NCBI/Uniprot data below describe general gene information for HECTD1. It may not necessarily be applicable to this product. E3 ubiquitin-protein ligase which accepts ubiquitin from an E2 ubiquitin-conjugating enzyme in the form of a thioester and then directly transfers the ubiquitin to targeted substrates. Mediates 'Lys-63'-linked polyubiquitination of HSP90AA1 which leads to its intracellular localization and reduced secretion. Negatively regulating HSP90AA1 secretion in cranial mesenchyme cells may impair their emigration and may be essential for the correct development of the cranial neural folds and neural tube closure. 1. HECTD1 may be involved in the regulation of ABCA1-mediated cholesterol export from unloaded macrophages to apoA-I.